Prominent & Leading Wholesale Supplier from Chandigarh, we offer insole full silicone, heel cushion silicone, silicone toe separator, insole omni silicone, heel cup silicone and medial arch orthosis. With firm commitment to quality, we manufacture, export and supply a wide assortment of Insole Full Silicone. Our offered product is ensures better weight distribution, reduces peak load, corrects anybody misalignment. This product is examined by quality experts so as to deliver a flawless range at customer’s end. We provide this product from us within a committed time frame at market price. Reckoned as leaders in this industry, we are providing our esteemed clients with excellent quality Heel Cushion Silicone. This product is odorless & easy to clean and maintain. Our product is manufactured utilizing the utmost quality material and latest technology at vendor’s hi-tech manufacturing unit. 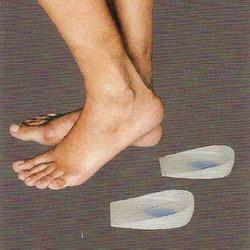 As well, our product has extra soft spot relieves pressure and pain at calcaneus. Being one of the reputed organizations, operating in this domain, we are engaged in wholesaling and supplying Toe Separator Silicone that is comfortable, offers better tolerance and compliance. The available products are manufactured under the direction of vendor’s professionals using supreme quality material following set standards. These products separates toe fingers, takes care of toe fungal infections like dhobi itch. 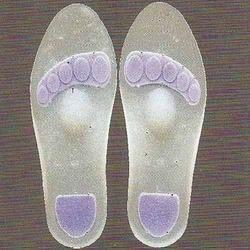 We are one of the leading firms, engaged in offering quality approved array of Insole Omni Silicone. This product has superior cushioning and comfort for everyday use. Our product is manufactured using high quality material and sophisticated technology in fulfillment with the set industry standards. Its soft fabric lining gives a feather feel and allows foot to glide into the shoe. Thin construction ensures, it can be used in normal shoes. Anatomical design, ensures better weight distribution. Helps to reduce peak load & correct any body mis- alignment. Extra soft spot relieves pressure and pain at calcaneus. Silicone has high cushioning co- efficient, absorbs impact, has a long functional life. It is odorless, easy to clean & maintain. Moulded, PU body gives a perfect foot anatomy for proper weight distribution, has antifungal, anti slip properties. Ensures long life with no cracks or deformation. Honey comb design makes it light in weight, and improves aesthetics. Fabric lining gives feathery feel, improves aesthetics & wearing, absorbs sweat & improves comfort. Quarter design is easy to wear in a regular shoe. 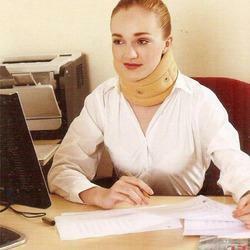 CoAnatomical design ensures uniform support, better immobilization & comfort .Very high density P.U. 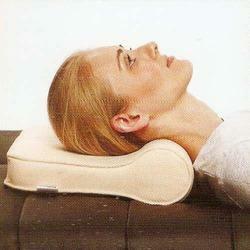 foam offers better immobilization, support & quick relief. 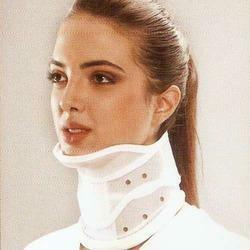 Also improves life of the collar, Hypoallergenic cotton stockinet improves comfort and compliance. 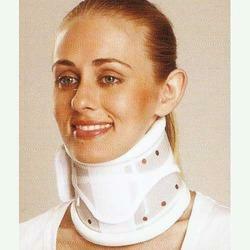 Perforated collar body improves ventilation and comfort. Long hook- loop tape ensure snug fitting and easy application. edges ensures rigid immobilization without a bite. Soft polyurethane foam provides unmatched comfort for geriatric/prolonged use. 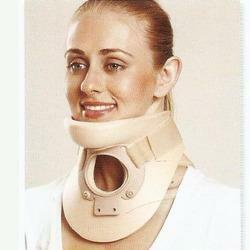 Used as prophylactic collar, for comfortable support during traveling. Hypo-allergenic cotton stockinet improves comfort and compliance. Anatomical design ensures uniform support, better fit and comfort. Perforated collar body improves ventilation and comfort. 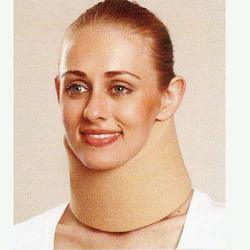 Pre-formed chin, improves immobilization & comfort. Balloon design allows minimal contact, idea! for burn patients. "Plastazote" is eco friendly, durable, non-allergenic, light in weight, & easy to clean. Frontal opening allows use of tracheotomy tube, improves ventilation. Two piece, anatomical design improves immobilization, comfort & application. Splints improve rigidity & immobilization. 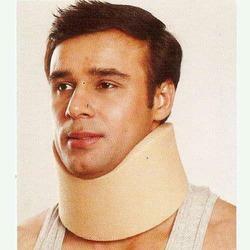 Pre-formed chin, improves immobilization & comfort. Balloon design allows minimal contact,ideal for burn patients. Ethafoam is durable, hypo- allergenic, light in weight, and easy to dean.Frontal opening allows use of tracheotomy tube, improves ventilation. Two piece, anatomicaldesign improves immobilization, comfort & application. Splints improve rigidity & immobilization. Looking for Foot Care Products ?